Dr. Sophie Carr founded Bays Consulting in 2009, supporting clients by developing pragmatic and robust solutions. 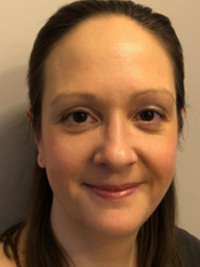 Sophie studied aeronautical engineering with French at undergraduate level at the University of Bath before gaining a Master’s Degree in applied mathematics and fluid mechanics at the University of Manchester. She also has gained her Doctor of Philosophy in Investigations into the Analysis of Baynesian Belief Networks at Cranfield University. My career started through a lifelong love of aeroplanes and puzzles. This combination led me to study aeronautical engineering as an undergraduate. In my first week at university my tutor asked if I’d like to live and work in France for a year. I immediately answered yes – the only difference to my course was that some lectures were in French, but that meant I got to spend my year in industry living and working in Compiègne, so it was worth the effort of getting my GCSE French up to scratch. Whilst I was studying, it also didn’t take me long to realise that it was maths which was the crucial element to engineering, I’m not actually that great at making ‘things’ work. Fluid mechanics is applied maths and it was this topic I specialised in for my Master’s degree. I started my career by working on a wide range on engineering and applied maths problems. My employer was very forward thinking and agreed to sponsor my Ph.D. It took me eight years to finish the work, during which I moved away from engineering towards analytics, got married and started a family. Working and studying is hard but it brings different perspectives to both parts of your life. Inevitably your employer gets someone who is up to date with the latest research and techniques, whilst your research benefits from time management, different ideas and someone who is very focused when they are at university. Don’t get me wrong, it’s not easy but I can’t imagine having completed my research any other way. By the time I was finally Dr. Carr (and I still inwardly smile every time someone calls me that!) I had moved into mainly working in applied mathematics, but I still really get excited over aeroplanes. About nine years ago I decided to set up my own company which has given me the opportunity to continue to work on mathematical problems. Quite a few of the problems are based in engineering, this is particularly true for the recent autonomy projects I’ve been involved in. I never set out to work in mathematics it has just evolved that way. Just as my career has evolved, so has my typical day. There are three main areas which need some form of attention on a daily basis. Firstly, there is the running of the company which includes finance, talking with suppliers and sub-contractors and checking in with my team. I took the leap of hiring my first employee so there is the inevitable paperwork / admin generated by e-mail. Next there is the project work, which often includes reviewing approaches, checking the underpinning assumptions as valid or starting to build and then test a model. Lastly, there are the longer-term research and development projects the company is to undertaking to build its overall capability. The variety of my days is a crucial part of why I enjoy what I do. Pretty much every business uses maths, but under a wide variety of names such as big data analytics, business intelligence or predictive maintenance, just to name a few. 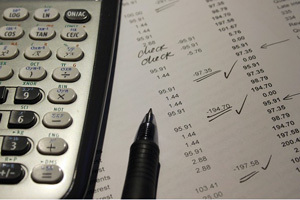 At a fundamental level maths is an intrinsic part of running a business – cash flow. Any business owner will tell you how important it is to know your figures – what money is coming in, how much is still owed to you and what your debts are. Not all businesses use maths to help make informed decisions and that’s when we help them understand where maths can add value to a business. For example, maths can help a business understand sales patterns, forecast demand for items, identify errors in a manufacturing system, or work out the most economical approach to posting items. Of course, there are a myriad of other areas where maths can help. Often the start of a project is helping someone structure a problem and then identify ways in which the problem can be tackled so a robust solution is achieved – that is where the need for maths is identified. It’s about getting over the barrier of a problem not being maths based or someone’s belief that they aren’t “that good” at maths so they actively avoid a maths-based solution. I am fortunate to be involved in the Royal Institution (Ri) Masterclasses – hands-on and interactive extracurricular sessions led by practitioners from academia and industry for keen and talented young people all around the UK. As with lots of things in life, I became involved with these through a chat over a cup of coffee. At the time, the Royal Institution was looking to increase the number of Masterclasses in statistics and the amazing team there who helped me develop a session on Bayesian Belief Networks. I really enjoy running the sessions, which are interactive workshops – it’s not just me at the front talking for two and a half hours! The questions asked and the level of engagement on a Saturday morning is phenomenal! As with all areas of work, I am forever tinkering with the presentation as new ideas about how to explain and present ideas come to me. Presenting to an expectant group of Year 9 students has certainly improved my presentation skills. It is also incredible fun, I always leave smiling and having really enjoyed myself as I get to show people how amazing Bayes’ theorem is and where its applied in everyday life, as well as meeting with the next generation of mathematicians. How we keep girls involved and interested in STEM subjects is an area of huge debate at the moment. I certainly don’t have all the answers. Personally, I think part of the problem is you often don’t know where your love of a subject started or why it stopped. That means can’t tell you why I was fascinated by engineering and maths from being young. I do remember being frustrated at only having LEGO sets that built houses and what I really wanted to do was build was a spaceship. Roof tiles doubled up as heat shields but I never seemed to have enough! For quite a while I was told that wanting to work with aeroplanes was a phase I’d grow out of, and that by saying this was my chosen career was just my way of making me stand out. When I graduated with aeronautical engineering my dad joked that maybe now people would realise this wasn’t a fad I was going through! I was so determined to work in an area which fascinated me that it didn’t really occur to me how few other women I’d meet along the way. It is important that children see there are lots of women working in maths and engineering and that whilst we might not massively promote ourselves on social media or the TV, we are there and this is a fantastic, interesting career you can work in your whole life. This says to me that as a community we need to create a bow wave of knowledge so people realise that there is a myriad of STEM roles open to women throughout their career. 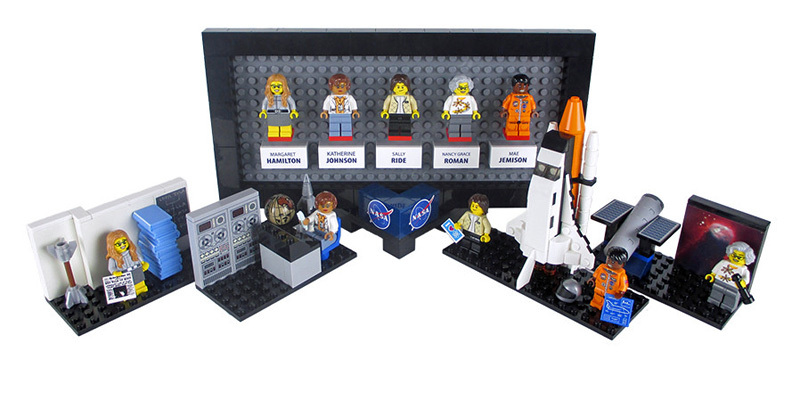 I’m also happy to say that at Christmas I finally got my first ever space LEGO set – the LEGO Women of NASA set, which now sits on my windowsill and makes me smile every single morning. I’ve still not got a spaceship though – perhaps for my next birthday. People have been trying to break the stereotype that to study or work with maths you need to be some mathematical genius for a very long time. 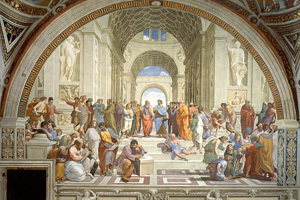 In Raphael’s painting, The School of Athens, the only person with a book who is working is Pythagoras. To improve at maths just like any other subject you need to practice and work hard. It was Arnold Schwarzenegger who said that the reason he won was when everyone else stopped, he kept going. I’m not sure how we start to break the stereotype that you need to be a genius, but a starting point could be for those working in maths to be honest about how we all keep learning, have to work hard and get the wrong answer far more than we get the right answer. It’s perfectly fine not to have a complete career plan mapped out – the road less travelled can be just as much fun. Keep working hard and looking for fun projects, you will find the area of maths which grabs your attention and in which you end up specialising. The future is looking really exciting. For the past couple of years, I’ve been working with Keen Marine on an approach to identify the provenance of landed shellfish catches, which I am going to be carrying on with as well as working on a range of maths modelling projects. This means I need to keep my computing coding skills up to scratch! Outside of that I want to continue to grow my business and maybe, just maybe get slightly more sleep.